i can haz teeching job now? 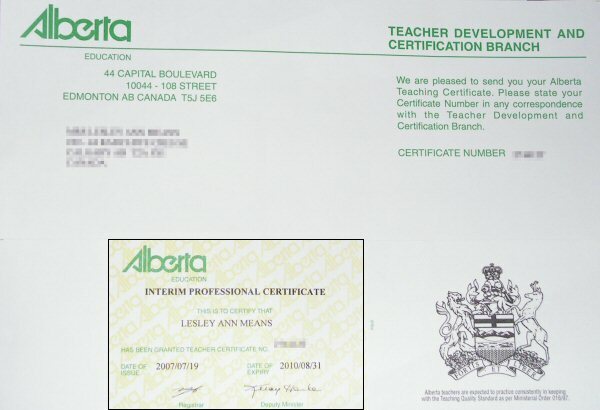 That’s right, the next big thing we’ve been waiting on… I got my Alberta teaching certification! After 10 months of waiting on Immigration, waiting a month for the Alberta teaching certification office to examine my Indiana credentials and deem me qualified to hold a professional teaching license was a cake walk. This weekend will be busy as I organize my resume and dust off my teaching portfolio that has been waiting ever so patiently to be needed again. The final step of fully immigrating feels so close to being complete now… there’s a light at the end of the tunnel, and I anxiously and happily await teaching again next school year. So the day we’ve been waiting 9 months for finally arrived: as of today, May 17, 2007… I am an official Permanent Resident of Canada! As I reported a few posts ago, I received notification at the end of April/first of May that I was approved for Permanent Residency, but today was the actual day I went in to the Calgary Immigration office to be granted the official status.